Okay, okay… our love affair with Red Velvet continues! This time a Red Velvet cake mix is transformed into an amazing cookie. The nice thing about these cookies are how simple they are to make!! Enjoy! I’m telling ya, these babies are to die for!!! 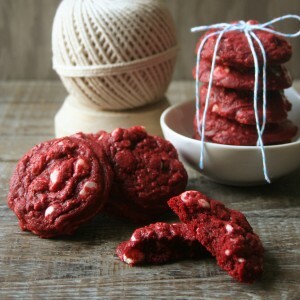 The combination of the red velvet and the white chocolate is aaaamazing! I made these for my daughter’s birthday (to take to school today). They seem a bit dry. 🙁 I think I should have added the flour at the end and just added enough to get it the right texture. I am wondering if it is because we live in such a dry climate. oh bummer, that may have been it. Next time I would do like you said, add it at the end and only add what you need to get the right texture. Hope your daughter has a great birthday, it’s my daughter’s birthday today too!! Very delicious recipe! I just didn’t put the white chocolate in it and used a cream cheese frosting for on top. Either way would probably be delicious! Just made these, and they are AMAZING! Not dry at all. Thanks for sharing! I just made these cookies to take to share with grad school colleagues tomorrow, and let me tell you they are so moist and delicious!! The dough seemed very dry and worried a little bit, but it made it really easy to roll into dough balls, and I only baked mine for 6 min 30 sec to try and minimize the white chocolate chips burning on the bottom. They taste amazing! Thanks for posting! I tweaked it just a little bit. I beat the butter first, then added the egg to that, then I beat the butter & egg mixture until it was fluffy. Then I added the dry ingredients, but I only added one cup of chips. They turned out perfectly and I’m planning on making them again for Christmas! I can’t wait to try these. I’m making them for a cookie swap this weekend. I rolled a variety of sizes and the larger ones were too dry for my liking, so definitely stick to rolling them into 1 inch balls, no bigger. Even the smaller ones are still not as moist as I would like my cookies. I followed the recipe exactly, but ended up with over 45 cookies. I’m not complaining, just wondering if that has something to do why mine turned out fairly dry. Is it true you can use German Chocolate cake mix instead of Red Velvet cake mix? I can’t find the Red Velvet anywhere! Yes, you can. You add 1 tbsp cocoa powder & a 1oz bottle of red food coloring to a box of german chocolate cake mix. These sound great! Could I use margarine instead of butter? And how much is two sticks?? Thanks for the recipe! I work at a cupcake shop during the school semester and we also sell red velvet cookies but they’re made from frozen dough. I’m on break right now and was craving them so I used your recipe and they are soooo yummy. Thanks a million. I sent these to my husband who is on deployment on a ship and he is requesting them again for Valentine’s day. I tried to make them into hearts, but look more like blobs…but they still are to die for!! Red Velvet is his favorite and I’m so glad I can send these to him. Thank you! If you use a muffin pan and place a marble on the side of the pan, it will make heart-shaped cookies! Mine were good, but a little dry, too! I’m going to try 2 eggs or less flour next time. I’m on the hunt for a perfect red velvet cake – well, red velvet anything – and have a ‘search party’ going on over at my blog and wanted to invite you to link up this and any other red velvet recipes you have! It ends at the end of the month. LOVE these cookies. Used mini semi-sweet chocolate chips and they were to die for. I just made these! I chose to use two eggs instead of the 1 that is posted and they came out PERFECT! my mom is usually so hard to please and does not much like cookies but she LOVED these. Such a great idea. Thanks for the recipe! Wish I had read through all the comments first as mine turned out dry also. I’ll add an extra egg or try less flour next time. I do like how they held their shape instead of flattening out. can you use the duncan hines red velvet cupcake mix? Just made these today – followed the recipe exactly and the dough came out very wet so I decided to keep the first batch in the oven for about 12 minutes, since they didn't look cooked through enough at 10 minutes. I regret my decision because that batch came out slightly burned. I left them in the oven for 10 minutes for the next batch and when I took them out they were very soft, but hardened nicely as I let them cool. These cookies are delicious! Oh it will be fabulous!! Used this as a base recipe then tweeked it. I added 4oz of cream cheese with the butter, 2 eggs and 1 1/2 tsp of vanilla. Changed the white chocolate chips to 3/4 cup and added 1/4 cup chopped pecans. My mom isn’t a red velvet fan, but she liked what I did with the cookies. is 2 sticks of butter the same as 2 blocks of butter (454g bars)?